With Easter comes my favorite time of year to cook a ham. Spiral sliced hams are popular in tons of households as a great holiday entree. This year, not only can you enjoy the classic ham dish, but one of these 25 Delicious Ham Recipes that are perfect for using up all of those leftovers in fun new ways. There is nothing as satisfying as knowing your leftovers can create great delicious ham recipes for breakfast, lunch and dinner for your family. Whether you are trying to create something delicious for snacking, or a full entree. There is something on this list for everyone in your family. Sandwich, brunch, breakfast, snacks, soups and entrees. 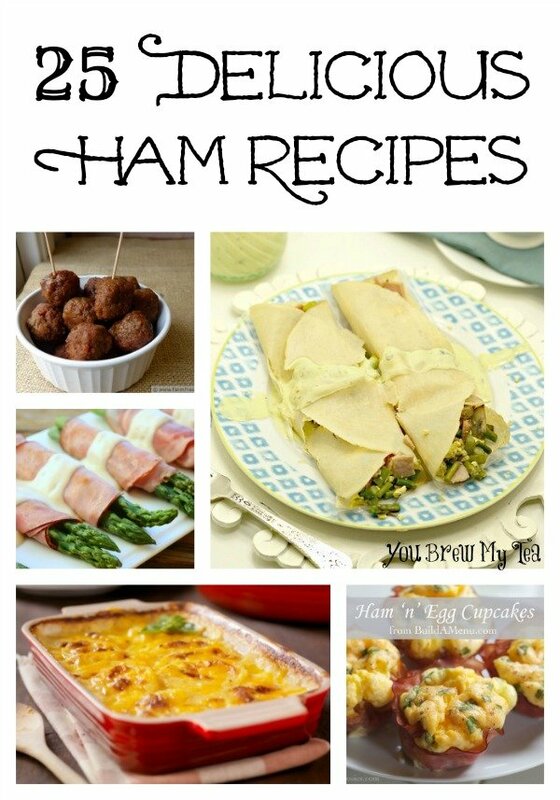 From great slow cooker recipes to the easy casseroles like your mom made growing up, you can’t go wrong with the yummy recipes on this list of delicious ham recipes for your post Easter leftover ham needs. Check out out other favorite recipe roundups below! Wow, do I need these recipes! I like ham but I lack imagination when it comes to using leftovers from a big ham dinner. With Easter coming up where I probably will serve ham I need this. PINNING!!! We only eat ham at Easter and Christmas, but we have ham for days after. The leftover ham and the dinners made from it are the best part! Thanks for some new recipes for ham! This is perfect for the timing of Easter with needing to make a ham as well as not wanting to waste any leftovers. Great list! Thanks for linking up with Delicious Dishes Recipe Party!